Taking an iPhone on an international trip can be a harrowing experience. Every time you post a status update to Twitter or check your email, you imagine your wireless carrier charging you a fortune in international data roaming fees. But there are ways to stay connected while you're traveling without freaking out about the cost. Taking advantage of some new features in iOS 7 and following a few savvy data-roaming strategies can ensure that at least that aspect of your trip is worry-free. Turn off Roaming and you'll use no data at all. 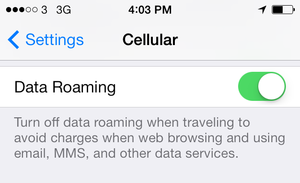 The most important iPhone setting when you travel internationally is found in the Settings app, in the Cellular section: Data Roaming. Turn this switch off, and when you leave the country, your iPhone will just stop using data entirely, even when it’s on the local phone network. But that’s a real all-or-nothing proposition. You’ll still be able to get phone calls and texts, and you'll get data whenever you're on a Wi-Fi network. But your iPhone will never transmit or receive data on the local cellular network. You’ll be free from data charges, but you’ll also be free from data. 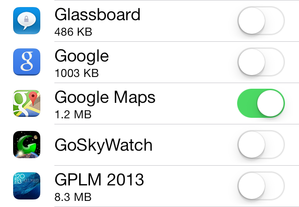 Use the Cellular portion of the Settings app to restrict which apps can use data and to monitor their usage. Fortunately, in iOS 7 there’s a way to control the data spigot app by app. Scroll down through the Cellular section of Settings and you’ll find the Use Cellular Data For section. From here, you can turn off Internet access to individual apps. If you’re traveling internationally and just want to, say, load Google Maps data without every other app on your phone generating hundreds of dollars worth of roaming charges, you can say so on this screen: Just turn off the switch for every single app except the one(s) you want to use. Even better, in this same section, underneath each app, you’ll see the amount of data it uses when you’re on a cellular connection. If you want to carefully monitor your usage while you’re out of the country, scroll down to the bottom of the Cellular section and tap Reset Statistics. Now you’ll be able to see exactly how much data you’re using while you’re gone. Before you leave the country, talk to your wireless carrier (or visit its website) to see what international plans it offers. It may be cheapest and easiest to buy a very small amount of (expensive) international data rather than paying roaming fees, especially if you’re going to severely limit your data usage or if you’re only going to be out of the country for a few days. For €20, I had unlimited data for a week. When I recently went to Ireland, I visited a Three store and bought a prepaid card for €20. I was in and out of the store in five minutes, about half an hour later my iPhone was on the local 3G network, and I had unlimited 3G data for my entire stay. I was shocked at how easy the entire process was. Offers differ from country to country, so it’s worth doing a little research before you travel. I was able to identify the right carrier, the right deal, and even the location of the store I needed to go to before I had even left the States. I only ran into one problem with this approach: I tried to log into my Facebook account, and it detected that I was logging in from an unusual location (Ireland). It wanted to do a two-factor authentication to verify who I was, by sending a text to my U.S. cellphone number. For that to work, I’d need to switch back to my old U.S. SIM card. If you’re on AT&T and your phone’s not at least two years old, you can’t buy a prepaid SIM card. Do you have a cellular-enabled iPad or (even better) iPad mini? Those devices are already SIM unlocked, so they should be able to accept a local SIM card just as easily as your phone. Toting an iPad mini around foreign streets might seem a little silly, but it could be a nice workaround if there’s just no other way. You could also consider buying or renting a portable Wi-Fi router that connects to the local broadband network—stick it in your pocket and connect your U.S. devices on Wi-Fi. If you’re planning on traveling internationally in the future, you might want to consider holding on to your old iPhone when you buy a new one, and having your carrier unlock it. If you travel a lot, consider buying an unlocked model or using Verizon or Sprint. My wife’s former boss splits the year between the U.S. and New Zealand, so she bought a Verizon iPhone 5 and uses a local New Zealand SIM card when she’s down there. It works perfectly. This should all work better than it does. At least T-Mobile is making some strides in this area, offering free 2G international data to its customers. For the time being, carriers seem content to overcharge international travelers for data, so it’s up to the savvy traveler to find ways to cut costs. If you’re using your existing carrier’s roaming plan, turn off data access for all but the most vital apps and turn off data entirely when you don’t need it. If you want to roam free, buy a prepaid SIM card from a local carrier and stop stressing out.